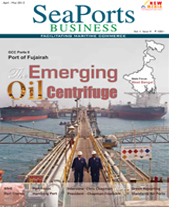 SeaPorts Business is India's first comprehensive magazine with in-depth information and analyses covering all aspects of ports and allied services and industries. The bimonthly magazine will cover a wide spectrum of issues related to Indian and international ports and their operations and services, port infrastructure, Inland Container Depots, Container Freight Stations, Rail Terminals, Special Port Equipment, services related to the handling, maintenance and upkeep of ports and terminals. It will also deliberate on issues concerning freight handling capacities and future readiness of Indian and international ports. SeaPorts Business also caters to shipping services operating on a global scale transporting break bulk cargo, oversized/heavy lift and project cargo.